My pick for winner continues to be Fits, even though it would mean back-to-back wins for Reiner Knizia. More info about the award is here. The next release from Jackson Pope’s Â Reiver Games will be Sumeria, designed by Dirk Liekens. Here’s some info about the game, including a pre-order discount offer that will end on May 29th. Players try to bring the city-states of ancient Sumeria to the fore. Each turn, players boost the importance of one of the city-states by flooding it with their traders, boosting its power. Each time a city-state gains power one or more will lose power. The aim is to gain control of the pre-eminent city-states during the scoring rounds at the end of each dynasty. Players have to time their movements, as a city-state can quickly lose favour too. Sumeria is an area control game for 3-4 players aged 10 and up. Games last 30-60 minutes. Sumeria will be launched at the UK Games Expo in Birmingham in June 2009. Pre-order your copy at the special pre-order price of Â£15 GBP – a saving of 40% on the retail price of Â£25 GBP. Shipping prices will be: First class to the UK – Â£3.11, airmail to Europe – Â£4.77 and airmail to the rest of the world – Â£8.12. You can find more info about the game including the rules at the Reiver Games website. The next game in Martin Wallace’s Treefrog line is Automobile, a game about making money set in the U.S. car industry in the early twentieth century. Details of the game, including a download of the rules, are now available from the Warfrog site. Â This looks another solid game from Martin and I’m looking forward to seeing it at the UK Games Expo early in June. 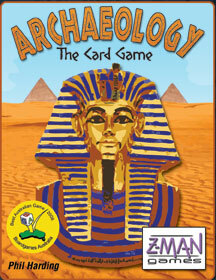 Last night, Jan and I tried this new card game by Phil Harding and published by Z-Man Games. I was pretty impressed as it plays really well, has a good theme to tempt non-gamers and is all wrapped up in 30 minutes. The fact that it won best Australian game in 2008 does not surprise me (although it probably didn’t have too much in the way of competition). Our game went right down to the wire with Jan winning by a single point: 106-105.